Rode NT1 | Gear Acquisition Syndrome!! 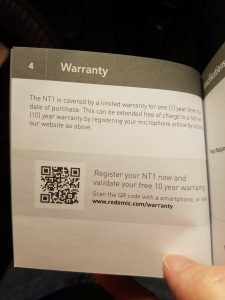 Interested in the Rode NT1, eh? I’m not surprised! 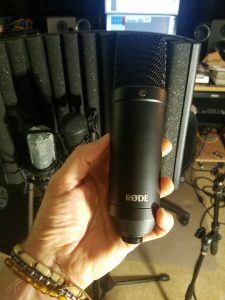 It has a really excellent reputation for being an incredibly useful mic in the studio and is touted in the ads by Rode as “one of the world’s quietest studio microphones”. Is that just hype? Or is it history?? Only a mic shootout will tell, so that’s just what we decided to do here today on Serious G.A.S. The answer to that question was the NT1 too many times for me to ignore, so here I am again, putting my money where my computer keys are! A favorite show around our house after dinner is “Forged In Fire”. Blacksmiths from all over the country come to compete for ten grand by forging an awesome blade. I end up returning quite a bit of what I review here. That’s not usually because it’s bad somehow; it’s just that I already have products in the studio that can do the job as good or better, so there’s no use throwing away my money. Those things that I keep, though, I keep because it is a genuine step up from what I have, OR because it is delivering a certain characteristic that I am lacking in the studio and thus it will provide me with another color for my sound palette that I’ve not had until now. Either way, if I keep it… there’s a very good chance you will too. So did I keep the NT1??? Before I let that audio cat out of the mic bag, let’s look at what we’re testing today. The NT1 was first released by this Australian company in 1991, and in just a few years found roaring success. The home studio market was just kicking in, those anxious to record their first album without spending hundreds of dollars an hour at a pro studio were quickly buying the latest home recording gear in droves. Rode then redesigned and upgraded the NT1 in 2003, and decided to call the upgrade the NT1-A. It sent their sales skyrocketing once again. Finally, in 2013, the latest version was released, the mic that is available to us today. 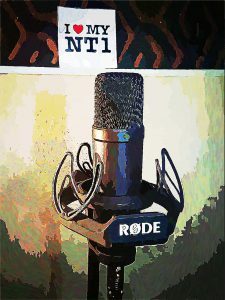 Rode dropped the “a” and once again labeled the mic the “NT1”, as a way of saying they were “going back” to a more vintage sound. Today’s NT1 is more popular than ever. It is consistently one of the most sold mics in pro audio retail stores every year. I verified this by asking several pro audio retail outlets that I frequent and buy from often. That kind of success doesn’t come accidentally. So how did Rode earn these accolades and sales?? Equivalent Noise Level (A-weighted) – 4 dBA!! … how good IS it?! It says a lot about a pro audio product when, no matter what audio website you visit, all the reviews average above 4.5 out of 5. That does not happen very often, so kudos to Rode for making a product that, across the board, is widely praised for its workmanship and sound. All the reviews I read simply said the product met or exceeded recommendations. I didn’t find any putting the mic through paces with so many things, as I did in my studio, however. So let’s check my results. 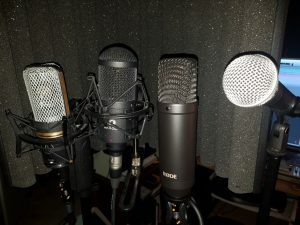 How did the NT1 fare against other mics when put to the test on various instruments around a typical studio?? 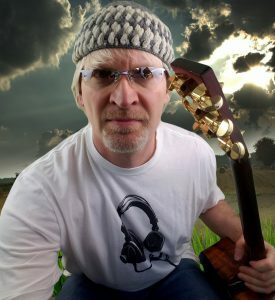 The ditty I wrote for this shootout features my Ibanez AE acoustic guitar, with freshly installed bone bridge pins (for more on how those can really change your sound, see THIS ARTICLE). IMPORTANT! : ALL of the following recordings contain NO preamps, NO effects, NO dynamic processing, and NO post manipulation in any way, not even fader riding for volume. 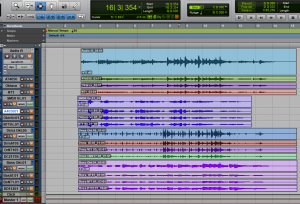 I want us all to hear what the mic, alone, can do, not my plugins in Pro Tools. For best fidelity, listen to the following recordings with quality headphones. You’ll get a much better grasp on the intricacies of each mic’s frequency response. For me, 1st place went to my favorite studio mic, the AT4050, which was the second recording. It always brings out the sparkle on an acoustic SO well, I wasn’t surprised. But the NT1, to me, came in second place! One thing I noticed right away is that the RØDE mic brings a homogenizing quality to everything it picks up. What I mean by that is a kind of aural sweet syrup that makes anything it hears more legato, more “mixed together”, more… cohesive-sounding. It’s almost like it has its own small bit of compression built in or something. Very interesting, and for certain types of instruments and songs, it would be a great asset. Third place for me was my Audix i5. Again, no surprise; it is my go-to mic for amp cabs and acoustic, tho’ I also have other mics in the mix too. This was a fun bit of vocalizing. When you hear the lyrics, you’ll understand why! Give a listen and ask the same question as before. It’s my “most important question” when choosing a mic. This was a tough one, because my tube Oktava mic and the NT1 both delivered a really good transfer for this song. I had to listen back and forth, six or seven times, before I made my final decision. The clincher came from walking out of the control room and listening from outside the door. that compression thing in the NT1 was evident again, keeping my loud and soft sections a little more even than the Oktava. Third place for me was my AT4050. I’d definitely have to dial out a bit of high frequency bite for this tune, but it was so much more dynamically interesting than the SM58 there was just no contest. For this test I decided to do something I don’t normally do – I took the “one mic on the drums” approach! I would rarely do this, as the music I write calls for more control over the disparate elements of the drum kit, but for this comparison it worked great. The full drum set was mic’ed by placing four mics FIVE feet out from the kick drum, and FOUR feet high off the ground. All were pointing in the exact same spot: the gap between two of my high toms, where the snare peeks through. The CM217 is a pencil, small-condensor mic that I use in pairs above my kit for overheads. They work really well for that application and they’re not that expensive. Sure, you CAN buy Nuemann KM184s for a LOT more, but if you’d rather… these work well. Give a listen and choose your favorite rhythmic mojo! I was really pleasantly surprised by the NT1 on this test! It won my 1st place vote because it clearly brought the most presence out of the whole kit, bringing its faux compression sound right where we needed it most. I mean, did you hear how it made the toms sound like they were right next to it?? How does it DO that??! My Oktava 319 came in second for me. I thought the AT4050 did great on the cymbal work, but it didn’t do nearly as well, at the distance of 4 feet where I placed it, at picking up the toms and snare with any beef. For that reason I put it third. My Ampeg PF-210HE cabinet had four mics on it for this part of the shootout. The AKG mic is, as you probably know, a good choice for any bass frequency application, so I threw that in. I don’t tend to record my amp and cabinet that hot. I find about 10 o’clock on my amp head, the Bugera Veyron Tube, is just fine for good tone and thumpiness. Place your bets, slide on in to this recording and let’s see where the cards fall! Here in low-low Land the tables were certainly turned for me. My 1st choice was the D112. No surprise since bass frequencies are what it’s made for! Second place for me was also a surprise: my AT4050! It brought definition and clarity to the envelopes of each note far better than the final two, so it shows me it’s versatility yet again. There’s a reason it’s my favorite mic! The NT1 in this comparison actually came in LAST place this time. I thought it added a muddiness down there that the other mics did not. In many instances, its smeary, buttery legato manner would really benefit a recording, but not here. So, 3st place then went to my Oktava 319. These Russian mics I got years ago and I they are good workhorses around the studio. I wouldn’t say they make things sound great, but they don’t make anything sound bad, so they’re definitely worth the investment. 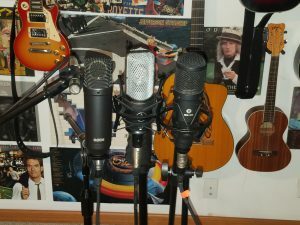 I usually use the pair that I have as second or third mics on some instrument. Without question, I was impressed by this mic. It is quieter than any other mic I currently own, yet you don’t have to have a preamp to get it sounding great in a mix. Its tendency to have its own “compressed” character really can work wonders for some things. Same for its tendency to “blend” a sound into a very legato tone, almost like there’s a hint of room reverb behind it, tho’ obviously there’s not. 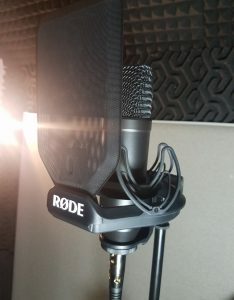 I recommend it to anyone wanting a versatile, usable mic for in-studio use. Just know that it has its own “flavor”, as all mics do, and use it when an appropriate instrument needs some audio love. The one you’ll need depends on what gear you have now, and how good you want the final product to sound. One thing’s certain: even if you get just the mic, you will quickly have a world of aural exploration at your fingertips. Go for it!! Just so you know, as usual, I have NO endorsements from any one company. I do these comparison tests first and foremost so I can get the best sound in my own personal studio, for my own songs and my own recordings. When I recommend a mic, it has nothing to do with company kick-backs, a free mic on the side, tour endorsements, or any other kind of slick, undercover deal. Does Slash Know About This?? Btw… one of the first things I asked when I looked into this mic is… what’s with the slash??? In their company ads, you’ll see that the company is called “RØDE“. Why is there a slash in the O? Is that just to get us to notice it more? Does their company speak another language? Did the printing machine malfunction and nobody caught it in time??! Here’s the dealio: ø is a letter in Scandinavian languages. It’s pronounced like the German umlaut “O”. 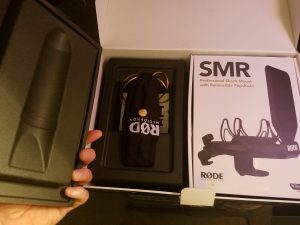 The word “røde” means “red”. Henry and Astrid Freedman, who founded the company, are originally from Sweden, so I guess they wanted to throw a bit of their heritage into the company moniker. All To-ge-ther Now… All Together Now! For those of you into MUSIC as well as gear (that is why we do this, right?? ), here’s all the recordings put together into a song! The tracks I used were the ones I chose as first place winners. I added just a skosh of reverb and processing. Hope you enjoyed listening first-ear to the recordings I made using the NT1. I hope those audio signals provides you, as they did myself, real insights into, not only whether this mic stands above the hype (it does), but how the NT1 stacks up on certain frequency spectrums against other mics on the market. Let us know your thoughts. Do you already use one? Will you now? Have you found anything better for the price?? Leave us a comment and fill us in on your wealth of studio knowledge. It’s a jungle of mics out there… thanks for stopping by and letting Serious G.A.S. 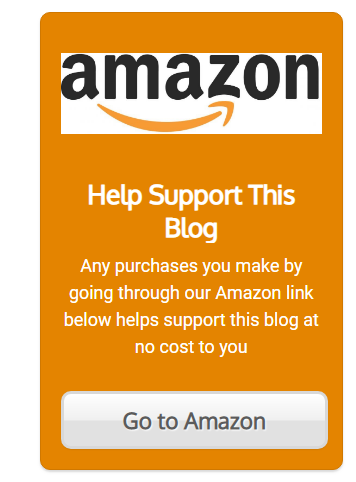 help you machete through it!! Without hesitation, I suggest the Audio Technica 4050. It has been my workhorse mic for years, and, when I do these shoot-outs, it still comes up number one for quite a few categories. Especially vocals. I did a thorough exploration of it in THIS POST. Check it out. Get one and your recordings will never be the same… in a GREAT way!! Thanks for taking all the time and effort to put this amazing comparison together, the Rode NT1 looks and sounds amazing! I found the side by side audio especially helpful. What is the best overall microphone in your opinion? For someone starting out with just one mike in a home studio?